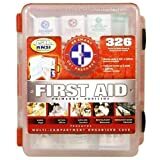 This highly organized kit provides comprehensive first aid treatment for a variety of needs. It complies or exceeds all OSHA guidelines for small business and meets ANSI types I and II requirements. The kit is fully organized for easy use and will treat many emergency situations. It can be wall mounted or stored easily. Clean: 30 Antiseptic Towelettes, 30 Alcohol Pads, 6 Sting Relief Pads, 3 Hand Sanitizers. Treat: 6 Antibiotic Ointment, 6 Burn Cream, 10 Antacid Tablets, 10 Aspirin Tablets, 10 Non-aspirin Tablets, 1 First Aid Guide, 1 Instant Cold Compress. Protect: 5 Adhesive Bandages (Metallic), 20 Adhesive Bandages 1″ x 3″, 55 Adhesive Bandages 0.75″ x 3″, 50 Adhesive Bandages 0.375″ x 1.5″, 10 Butterfly Bandages, 18 Wound Closure Strips, 2 Gauze Rolls, 3 Protective Earloop Masks, 2 Eye Pads, 10 Sterile Gauze Pads 2″ x 2″, 4 Sterile Gauze Pads 4″ x 4″, 1 Sterile Trauma Pad. Additional Supplies: 20 Cotton Tip Applicators, 1 Adhesive Tape Roll, 5 Finger Splints, 1 Triangular Bandage, 4 Examination Gloves, 1 pair Metal Scissors, 1 pair Metal Tweezers.